Slime 40001 Power Sport Tire I..
Slime 40001 12 Volt Tire Infla.. 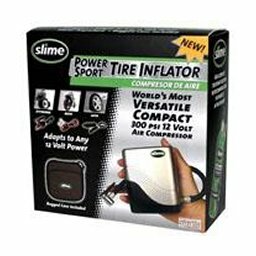 I have been looking for a portable tire inflator I can use for my motorcycle and with the lack of choices, I deicded to give the Slime Tire Inflator a try. The inflator is really small (a little larger than the palm as the picture indicates) and comes with a case that fit all the wires and the unit itself. The unit draws power only from the battery so you can't plug it into a power outlet from your house. You can either draw power with the alligator clip, a pre wired power source (just like the ones from..
J. Lee - See all my rev.. This is a neat little addition to any bag of motorcycle gear. 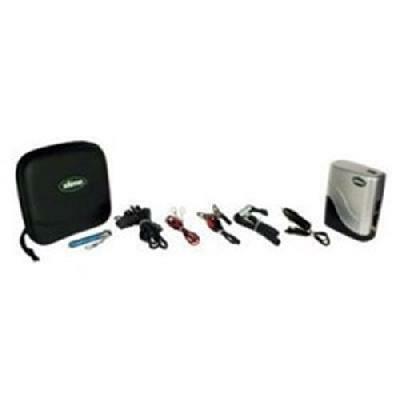 This little kit is small enough to toss in your bag and forget you have until you need it. The air pressure gauge feels a little cheap, but that is something you can fix by purchasing another one for a couple bucks. The compressor itself feels very solid, but makes a ton of noise when in use. But this isn't a problem for me, especially since I ride a 600cc lawnmower. The kit comes with a nice assortment of connectors to a power source. I d..
Vic (USA) - See all my .. I was excited to say the least when I tried my new Slime power sport tire inflator, I had a low tire on my car and I didn't want to drag out my large compressor so I thought what a perfect time to try out my new slime purchase. It worked great and in no time had my tire back to the recommended pressure. I love the compact size as it will fit perfectly on my Honda Goldwing!this is exactly why I bought it.The only draw back I could see was with the mechanism that hooks up to the valve stem, which seems to be ..